Starting a web hosting company can be quite lucrative if you start it off right. If you're a small company with a small budget a web hosting template could save you a lot of money in the beginning allowing you to spend money on other services.. or servers that will help you grow. Listed below are 15+ web hosting templates that will help you jumpstart your hosting business, or help you move to a new design if your current site isn't the best. With a bit of customization these hosting templates can be made to seem really unique. And some of these templates are available as WordPress themes in case your site is running WordPress. 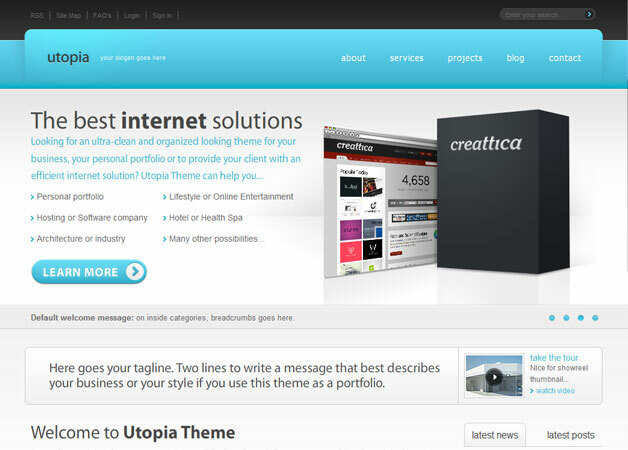 Utopia is ideal for a web hosting business and is the most impressive template of the bunch listed here. It is valid XHTML, and no word yet on a WordPress version. But if you're wanting an HTML template to start up your hosting business this would most likely be the one I'd start with. 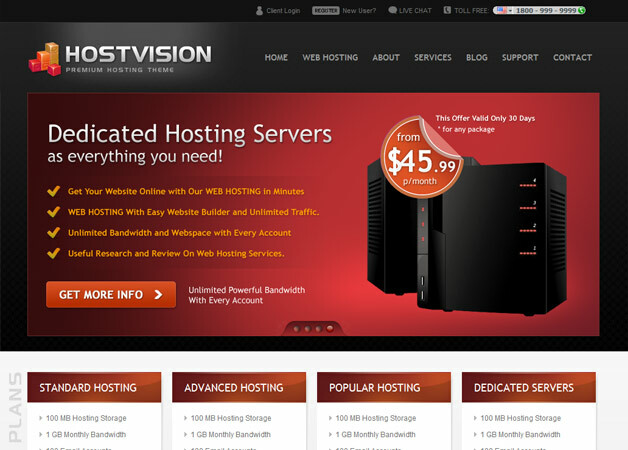 Epsilon is best suitable for a Hosting Business or similar company. 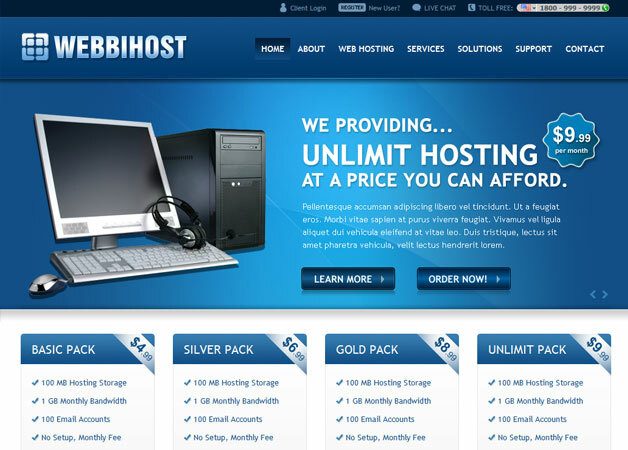 It comes with two options: hosting theme and business theme. You get complete pages with Epsilon (Pricing table, Blog page, Portfolio page and many more), this theme is easy to modified and have well documented. Also available in a WordPress Theme. Planet Hosting is a Web 2.0 style template suitable for web hosting business. Comes with two options of hosting plan pages. 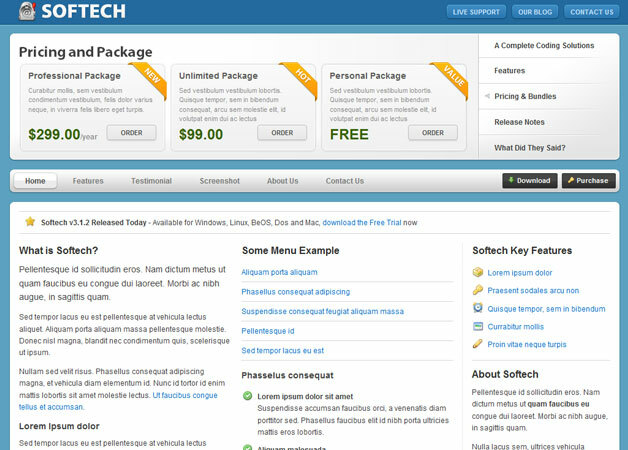 Softech is a XHTML /CSS template for a software or hosting company. This template have two column layout, jQuery Tabs for slideshow and fix width. This site is best suitable for a Hosting Business, Company, Blog, Portfolio, or freelancer portfolio website as well. For a Navigation Colors and Content Background Color Settings Please follow steps provided in PDF Help file. Most part you can just follow the HTML with commented codes. Highly customized About Page, Blog Page, Portfolio Page and Services Page, you are able to edit each block as i have well commented each code. Portfolio page with full ease of customizing options. Portfolio page with pretty photo. Blogging page included with easy to edit coding. PSD file with perfectly layered and named, if you want to edit an existing Theme or create your own image, PSD File included with names and grids for ease of slicing. Cluster is a clean, modern and web 2.0 HTML Template suitable for web hosting company website. This theme also can be used for corporate, business and company sites. This theme provides all the main functionality you will need to present your hosting company in a professional way. Simple Hosting is a complete hosting website template. 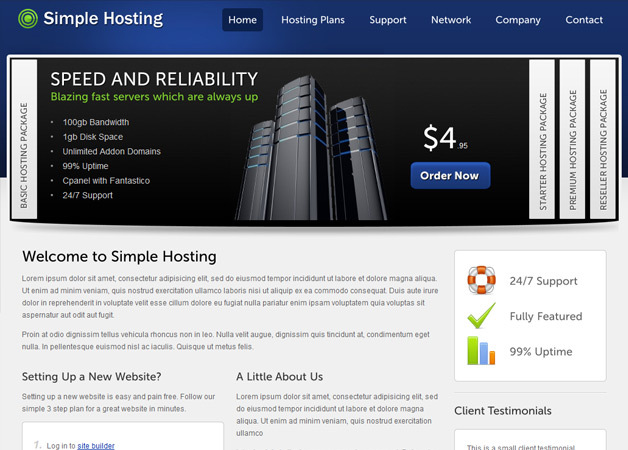 Get your web hosting company off to a great start with a fantastic professional template. Clean hosting template with many features you'll find to use for a hosting website. 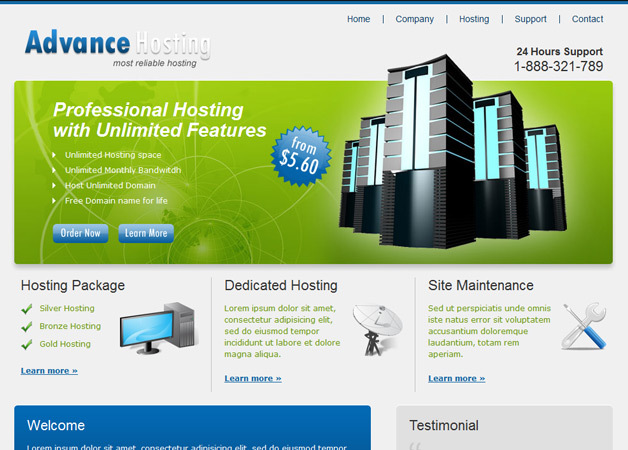 Advance Hosting, clean style web hosting template. 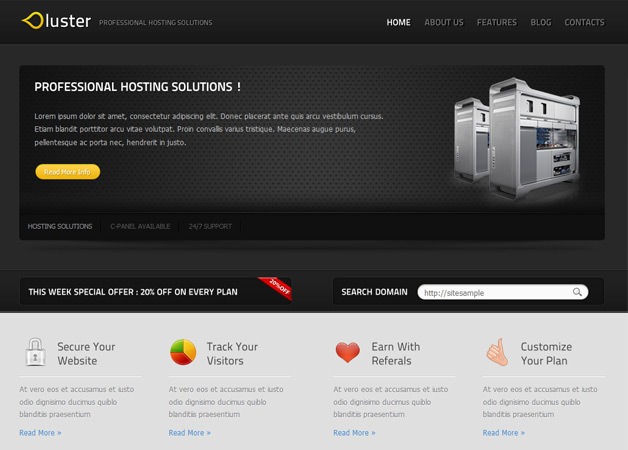 HostingSquare is a clean, modern and web 2.0 HTML Template suitable for web hosting company website. This theme also can be used for corporate, business and company sites. HostVision is a clean and stylish template with a homepage slider and other features that make this template very professional looking. 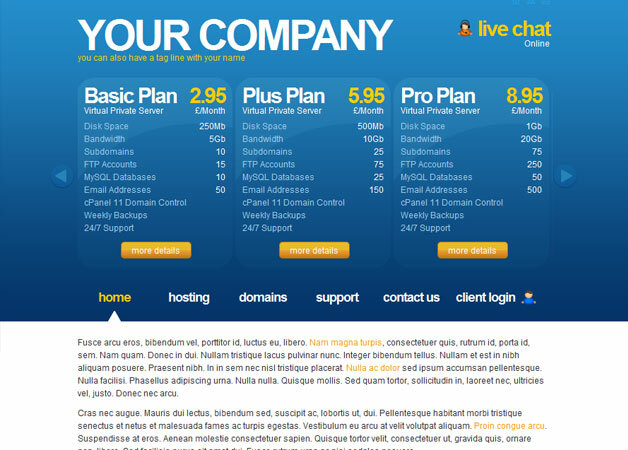 A clean Web 2.0 style template for a web hosting company. However, could be cut up and used for a variety of things. Template is valid XHTML 1 .0 Strict, CSS tableless design. CSS is easy to understand and nested for clarity. Comes with coded homepage (jQuery based hosting plan slider in the header), hosting page (client testimonials slider), domains page, support page, contact page and client login page. 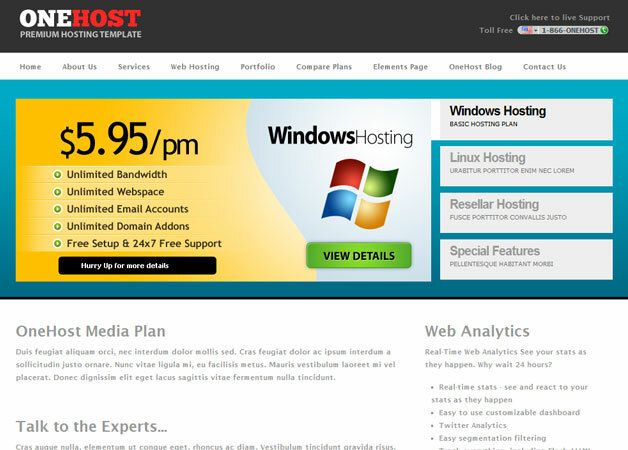 Webbihost Template is feature rich template with a homepage slider, dropdown menus and more. This site is best suitable for a Hosting Business, Company, Blog, Portfolio, or freelancer portfolio website as well. For a Navigation Colors and Content Background Color Settings Please follow steps provided in Help file. Most part you can just follow the HTML with commented codes. 1. Servers: If you're just starting off reseller hosting might be your first choice to start with. Reseller hosting is cheap and you can actually make a nice return on your monthly investment using it. But keep in mind you should always choose a reliable host if you're going to go with reseller hosting. And make sure you can easily move away from them when you do grow. I'd most likely choose Hostgator if I was starting out because they've been around a long time and their support is very impressive. They offer cheap reseller hosting as well with lots of bells and whistles to get you started. 2. Billing Software: We were running Modern Bill in the past and it was actually quite good. The problem came though when we didn't have billing set up to auto-renew people's accounts. I'd recommend starting with something like Modern Bill or similar like WHMCS. Do make sure you have your billing software set up perfectly before you start and always make sure it's upgraded because after all this software will hold all your customer info. It's really important to have billing set up and running smoothly. 3. Support: Like most companies you'll need a ticket system so your customers can open support tickets. Ticket systems with knowledgebases are great for supporting your clients because they keep track of everything and allow you to sometimes answer support requests before tickets are opened. It's a good idea to invest in a good ticket system like Kayako (kinda expensive) and also ZenDesk. ZenDesk looks quite impressive actually so I'd choose to go with them or similar. 4. Outsourcing Support: Like I mentioned earlier support can really get out of hand if you have hundreds or thousands of clients so it's good to have a business plan that alocates money towards outsourcing support if you're a small company. There are many hosting support outsourcing companies out there today then there were years ago. I don't have firsthand experience working with any of them but I do know Bobcares has been around a long time so they must be doing something right. They have support plans for small companies just starting out who are using reseller hosting if that's what you're doing and can't handle or don't want to handle support requests yourself. 5. Web Design: I've listed web hosting templates here so you can easily get started, but you should really customize these templates in a way so they look unique. If you're not totally savvy to editing HTML templates then hire someone with a good eye to help you. Even though these hosting templates are cheap you'll have to spend a good amount of time editing them with your unique info. DO make sure your content is unique. And the more stylish your site looks the better you'll do. 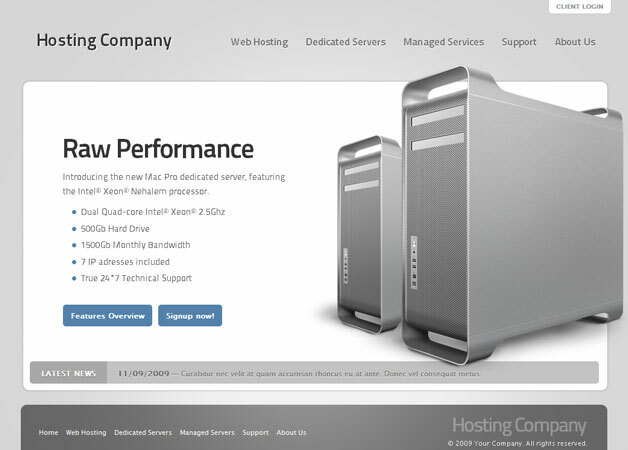 Take a look at the top hosting companies online today and see how their sites look. They have big budgets to spend on design so if you can imitate them without copying their design it's a good thing. The templates listed on this page should help you get started in the right direction. 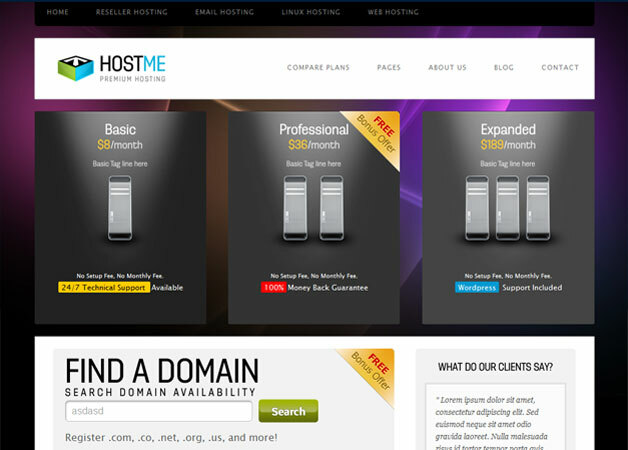 Hope you enjoyed this list of web hosting templates. I'll be keeping this page up-to-date as new hosting templates are released.